Jul 9, 2015 • [By Adam Voiland, NASA Earth Observatory] Traditionally, hydrologists have estimated the width of rivers by examining topographic maps and backing out calculations from the amount of river discharge measured at certain points along the watershed. While this approach offers a ballpark estimate, other factors—such as the cohesive strength of the sediment in a river’s banks or the presence of dams—can throw such estimates off significantly. Now hydrologists from the University of North Carolina have come up with an innovative way to estimate the size of rivers via satellite images. 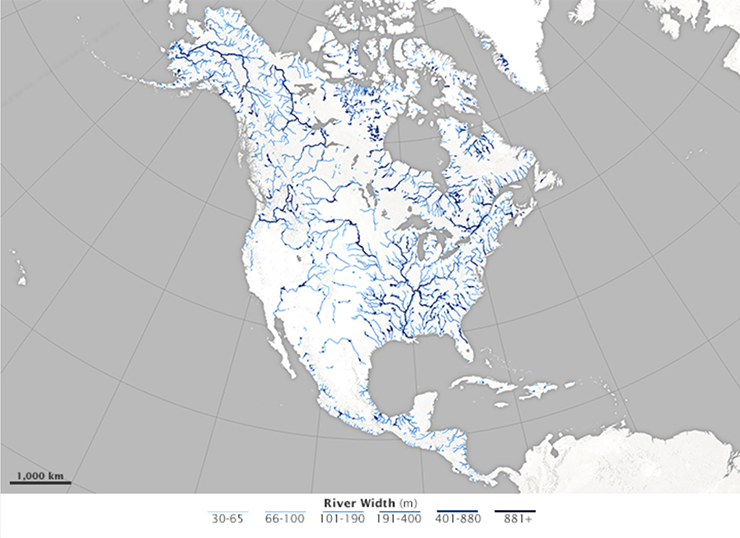 Combing through data acquired by Landsat satellites, George Allen and Tamlin Pavelsky have compiled a new database of river widths for North America. The database was created from a collection of 1,756 Landsat images with minimal cloud cover and rivers free of ice cover. To minimize the influence of seasonal changes, all images were selected for times when each river had its annual average discharge. Allen and Pavelsky then ran all of the images through a software program that automatically locates the center line and edges of a river. The result is the continental scale map of river widths, shown at the top of this page. Width is depicted with shades of blue, with wider rivers appearing darker and thinner rivers appearing lighter. For a closer view of the entire continent, download and explore the large version of the map. Why did Allen and Pavelsky go to the trouble of estimating river width by satellite when people could simply go out in boats and measure them from the surface? 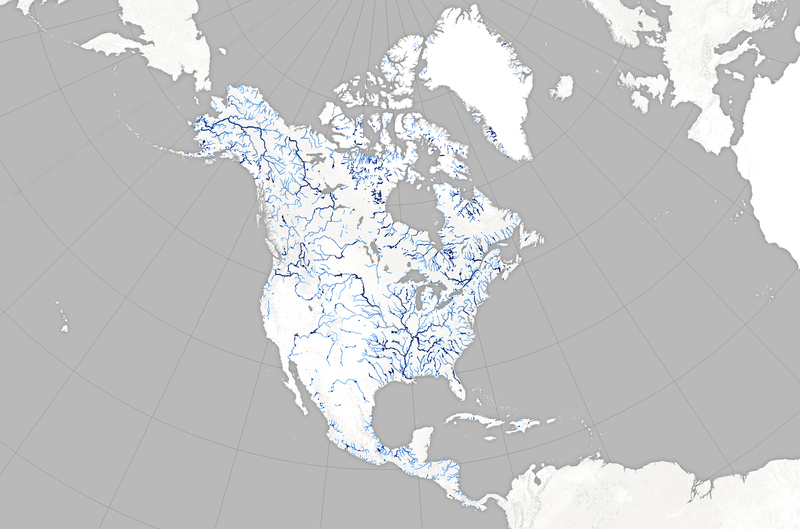 Because little is known about river width in far northern parts of North America (image below), and getting to many of those rivers can pose serious challenges. Also, accurate river widths are useful for analyses of flood hazards, studies of ecological diversity, and estimates of the volume of greenhouse gases released by rivers and reservoirs due to bacterial activity. Most significantly, the river width database is part of a broader scientific effort to prepare for the upcoming Surface Water and Ocean Topography (SWOT) mission. The satellite—a collaboration between NASA and France’s Centre National d‘Etudes Spatiales—is scheduled to launch in 2020. It will map water elevation and areal extent with unprecedented detail. “The river width database provides more accurate estimates of both the widths of rivers and their locations,” explained Allen. “We will be able to measure both of these things from SWOT, but both will have errors. It’s really useful to have a prior estimate of river location and river width that can be used to constrain SWOT measurements.” In continued preparation for SWOT, Pavelsky and Allen are working toward a global map of river widths. Allen, G. & Pavelsky, T. (2015, January 28) Patterns of river width and surface area revealed by the satellite-derived North American River Width data set. Geophysical Research Letters, 42, 395-402. University of North Carolina North American River Width Data Set (NARWidth) Accessed July 2, 2015. NASA Earth Observatory maps by Joshua Stevens, using data from Allen, G. H., & Pavelsky, T.M. (2015). This entry is filed under News, Science Brief, Water.